The award-winning Community Supported Art program (CSArt) returns for 2014 with a fresh crop of local artists. The Cambridge Center for Adult Education –in collaboration with the Cambridge Arts Council, the Somerville Arts Council, Cambridge Local First, and Somerville Local First — is repeating its very successful Community Supported Art program (CSArt) to help get affordable work by local artists into the hands of local buyers. This project is partially funded by an Adams Arts Program grant from the Massachusetts Cultural Council. CSArt 2014 shares cost $300. No more than 50 shares will be sold in each round, to keep the line of art special. Shareholders receive all nine works of art — at a fantastic value — from emerging and mid-career artists; develop relationships with local artists; discover new artists; meet their fellow shareholders; and explore a variety of disciplines. CSArt features unique art, not commercial, mass-produced articles. That’s what makes it special! 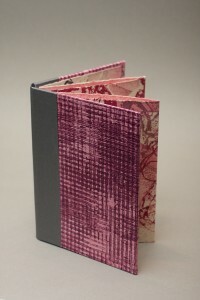 Cristina’s contribution is Lace Lost, an artist’s book from her ongoing series, Catcher, Catch Her. Created in a series of 56 unique, yet similar artworks. Antique lace is inked and printed over and over until it disintegrates producing a profoundly sad, yet beautiful image. This type of printmaking can mimic a narrative typically expected in books. Here, the conceptualization continues into ideas of lifetime, changes in femininity and fertility, and mortality. Image ghosting, those echoes of the previous print, can take the place of memory, as the layers of lace are printed.